UPDATE: We are so happy to share that Quintarius has earned his high school diploma and six months to the day after his double lung transplant, he walked in his graduation ceremony at Brewbaker Technology Magnet School. Congratulations, Quintarius! 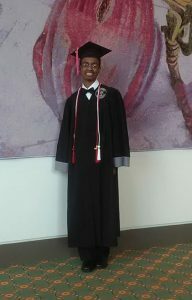 His plans are to earn his bachelor’s degree and become a video game developer. The first thing you pick up on while talking to LaShunda Harris is that she isn’t worried about the small things in life. This, despite the fact that her 17-year-old son, Quintarius, had a double lung transplant four months ago. Despite being hours from her other children, Kintarria and Amauri, and family in Montgomery. 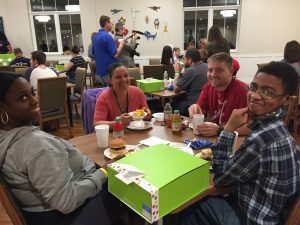 “When you’re at the Ronald McDonald House, you don’t have to worry about anything,” LaShunda said. This dedicated mom has spent 16 years shuttling Quintarius to and from hospitals around Alabama and all the way to St. Louis, Missouri, in an effort to find healing for him. 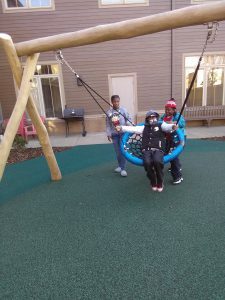 LaShunda says that journey makes her appreciate that the House is so convenient to everything they need: the hospital and Quintarius’s doctors, the grocery store, restaurants and even fun things to do like ice skating at Railroad Park or visiting McWane Science Center. And the quiet. LaShunda says she can get rest at the House, which isn’t always possible at the hospital with noise from machines, doctors and nurses coming and going and the stress of surgery. Families here at the House like to say the hospital is a place for healing, not sleeping! enough that he didn’t qualify to be on a transplant list. Just before Halloween 2017, that all changed. LaShunda says that Quintarius doesn’t like a lot of attention and doesn’t like to make a fuss for anyone. So when she went to pick him up from school on October 30 and he came out in a wheelchair, she said it was a red flag. “He kept telling me his chest was hurting,” she said. So they went to the hospital in Montgomery for initial treatment and were then transferred to Children’s of Alabama, where they stayed for a week. LaShunda said Quintarius was getting much worse at that time. They moved to UAB Hospital and by November 13, 2017 Quintarius was added to the transplant list. The next day, he was put on ECMO, a specialized life support machine specifically used to help cardiac and respiratory patients. LaShunda gets emotional talking about that time because Quintarius’s condition was so grave and so much was uncertain. Quintarius immediately went into surgery and received his new lungs. He did have to stay in the hospital for about two months recovering but it’s clear he’s grateful for this gift. “The organ donor really wants somebody to be happy in their life, because they have what the other person doesn’t have. And they think that giving their organs to them can help them,” he said. 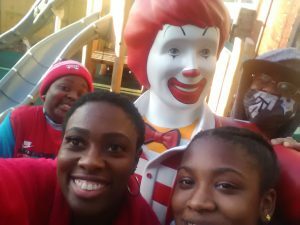 During all of this, LaShunda says staying at the Ronald McDonald House helped her in so many ways, including allowing her to be with her other children, Amauri and Kintarria, on weekends. They were also able to stay at the House with LaShunda and Quintarius over Spring Break. The siblings say they like the room they have at the House and Kintarria says the welcoming staff has made a big impression on her. The family stayed in a two-bedroom suite, a welcome addition in the Max and Lorayne Cooper East Wing. These suites are designed for families who need to be close to the hospital for long periods of time and might also be immune-compromised after surgery. They say it was so nice having the suite after Quintarius was discharged from the hospital, but still needed to go to clinic frequently for the doctors to monitor his progress. In addition to private bedrooms and a bathroom, there’s a kitchenette and small living room that Quintarius and LaShunda can enjoy. The teen says all these things add up when you’re in his situation. “It makes you feel like you’re a bit closer to home. Instead of being so far away and being homesick. 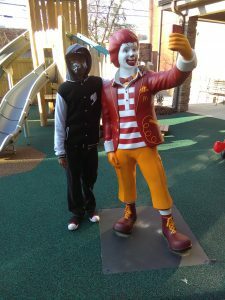 It helps being at the Ronald McDonald House,” Quintarius said. In five months, so much has happened to the family but we are so happy to share that they are home now! Thank you for your support because it helps the Harris family and so many others.